Day 22. May 28th. St Jean de Muzols. A lazy late start with breakfast al fresco in sun and a cloudless sky. 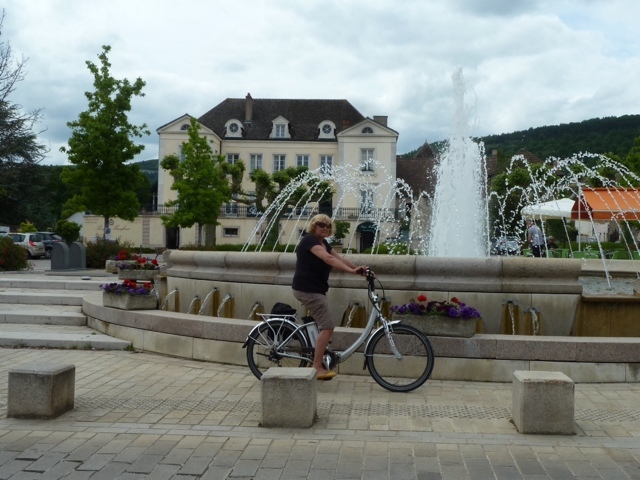 We decided to cycle in to Tournon - sur- Rhone the next town from St Jean. 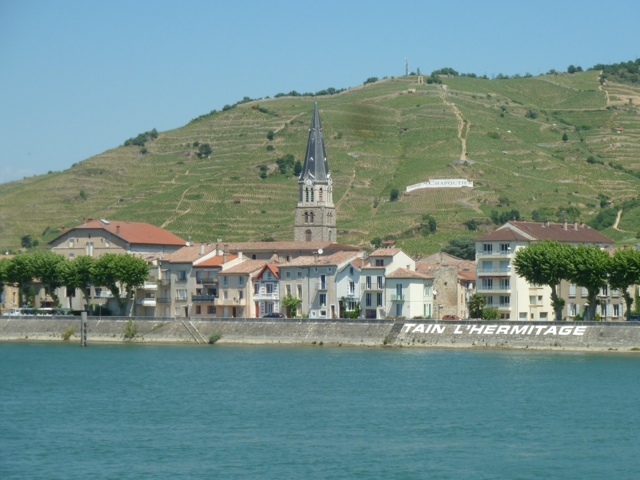 It is linked by some dramatic bridges to Tain l'Hermitage. One of the bridges is for pedestrians or cyclists so we took that! 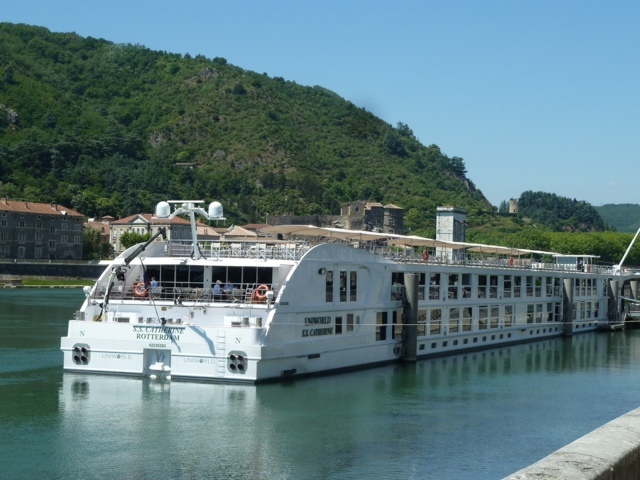 Both these places are departure and stop off places for river cruises. 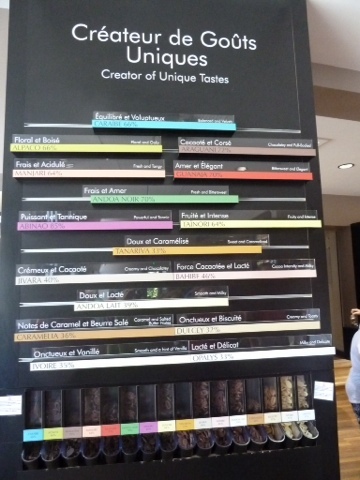 In Tain l'Hermitage is La Cité du Chocolat - Valrhona - a name Carol recognises from the posh chocolate shelves in Waitrose. There is a paying tour which takes you through the various processes and tastings but we arrived and entered the boutique - we guess the shop at the end of the tour. This was a chocolate lovers dream! There were so many different chocolates to try - and all for for free! They had this great chocolate dispenser, you didn't even have to ask, just put your hand in to collect all that lovely chocolate. The dispensers are at the bottom. If you look closely you can see the descriptions are in French and American. When one is empty it just gets filled up again. Milky chocolate on the right, darker chocolate to the left. The place was full of a party from a Vikings river cruise - Americans mostly, Australians, British etc. they were filling their boots just as we were - like labradors in a sausage factory! We bought several future gifts of said posh chocolate and were given loads of free samples in our bag also - as though we hadn't already eaten enough free samples. We left feeling we'd consumed the equivalent of a 3 course meal - of chocolate- which we probably had! 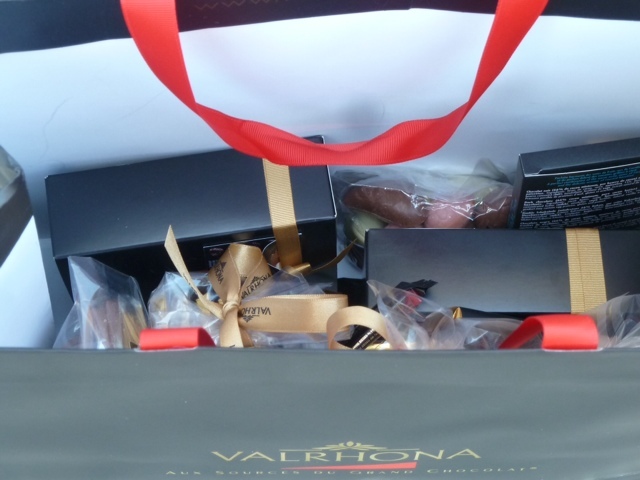 Gift bag containing bought gifts and beaucoup d'échantillon. Back to Tournon- sur- Rhone and a visit to the shop of Paul Jaboulet Aine - a wine producer. It also had a restaurant attached - very civilised. After a tasting of - yes - the cheaper wines - we purchased a couple of bottles of white, a rose and a red just to keep us going. Then peddled quickly back to the site before our luxury chocolate melted in the hot sunshine. There followed another period of dossing as Graham would say. 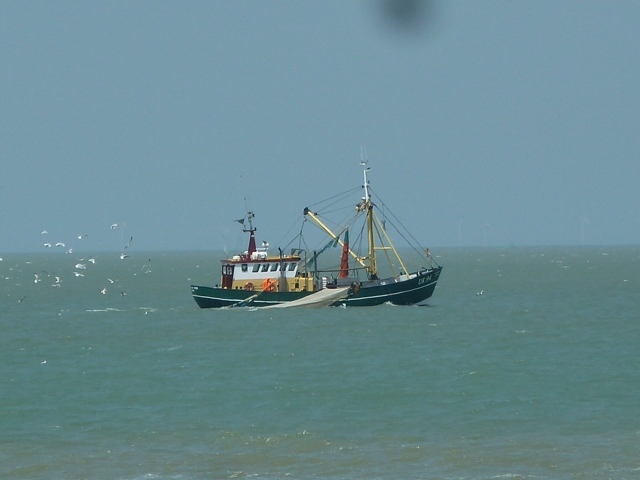 Tomorrow the weather forecast is more of the same - this is definately more like it! Day 23. May 29th. St Jean de Muzols. Another lazy day starting with a leisurely breakfast al fresco. 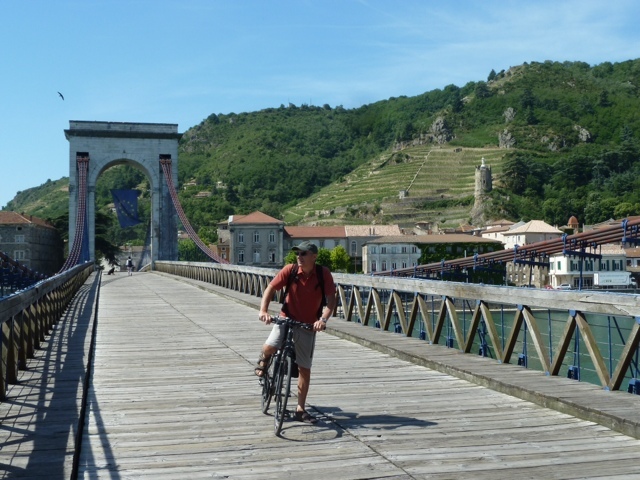 Cycled back to Tournon - sur - Rhone - think it's about a 10 km round trip. This time found a way through side streets so avoiding the one car every two minutes main road. We did a walking tour through Tournon which was larger than we had thought and then walked across the road bridge to Tain l'Hermitage. We came out just a few minutes away from the chocolate place ,Carol was tempted briefly to have a go at another lunch of chocolate but decided against it. She was disappointed she had not forward planned - what if we'd filled our pockets with sandwich bags and filled them with all the yummy samples?! We could have made gift bags for free! 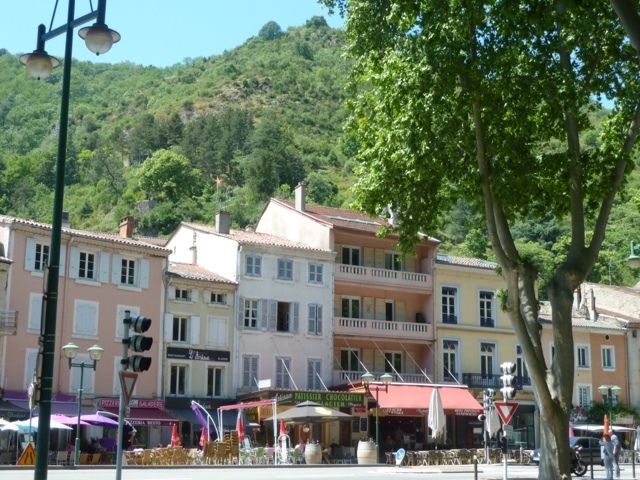 Walked along the river side and back over the pedestrian bridge to Touron sur Rhône. A lovely way to spend a couple of hours. Back for another al fresco lunch and a chiiled glass of rosé or two (purchased yesterday.) followed another afternoon by the pool. Tomorrow we will move on back north - not sure where we will spend tomorrow night, we will decide on the weather when we get there, but we need to start heading north. Will be sad to leave this sunny laid back site. Temperatures have been between 23-28 degrees - very pleasant. Score for Camping le Castelet - 9.8/10 - would have been a 10 but that is impossible. It is a family run site and our hosts are lovely - the happiest couple we've ever met, nothing is too much trouble for them. This is the best site this year. Day 24. 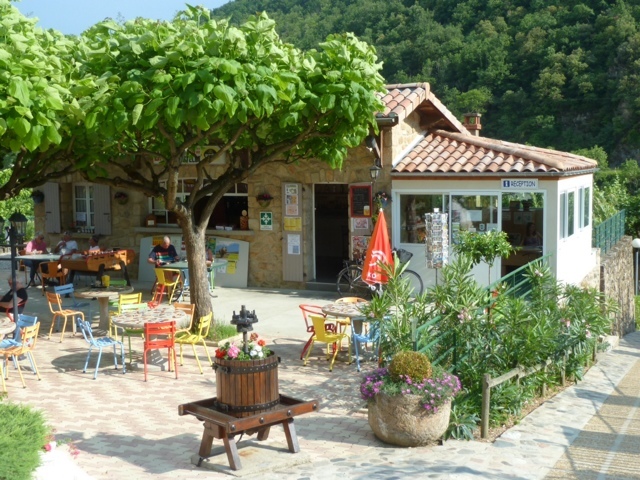 May 30th St Jean de Muzols - Chagny 162 miles. A day on the road as we slowly move up north. Back to Burgundy and the hope of more wine tasting tomorrow! Mostly time spent on the péage motorway. Arrived at our Campsite mid afternoon and after settling on our pitch decided to walk in to Chagny centre. It was so quiet! It's Saturday for goodness sake! The only thing we noticed was there were an amazing number of Patisseries - obvious a town of sweet tooths. Dinner chez Rex and an early night. Another nothing day today. Day 25 May 31st. ( Mother's day in France) Chagny - Savaney cycled 17 kms. Walked in to Chagny centre this AM - it was heaving! Market day. The biggest market we've ever seen! We recognised a few stall holders from when we went to Beaune. Lots of people buying floral gifts as it is Mothers Day. Massive queues for the cooked chicken stalls - which were cooking potatoes and veg in the dripped chicken fat below the rotisseries. Decided to join them and bought a chicken to have for lunch chez Rex. You could either have the chicken as it was, or with another bag ful off juice and vegetables - ready made Sunday lunch, yum yum. 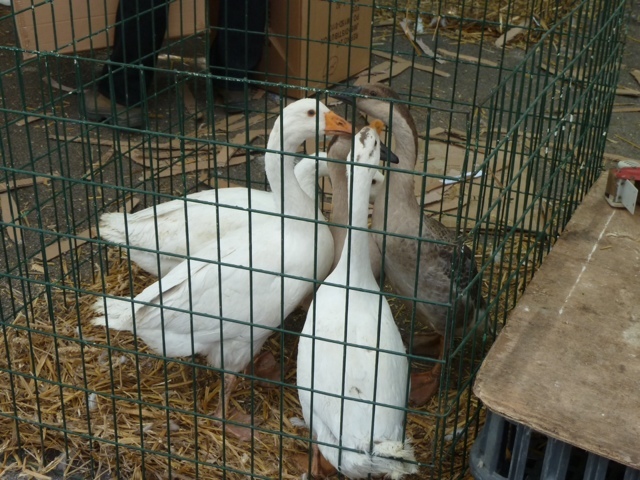 Not only cooked chickens were for sale but very much alive ones of varying breeds and geese and chicks! Choose your chicken, put him in a box and carry him home. €11.00. We've heard they are good for keeping snakes at bay, maybe that's why they're so popular. Back at the campsite Graham decided to check out the pool - it didn't exist. Conned again. The pool was municipal around the corner so he went to investigate. The lady told him it was €1 all day and heated to 28^C. 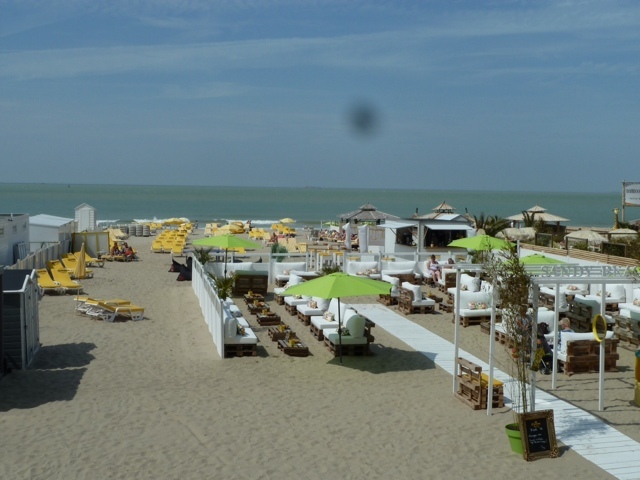 Duly paid a euro and had the pool to himself, along with the ticket lady, the clothes lady, and two lifeguards. The pool was 25m x 15m x 1.8m at one end rising to 3.5m at the other. How much would that cost to heat every morning? 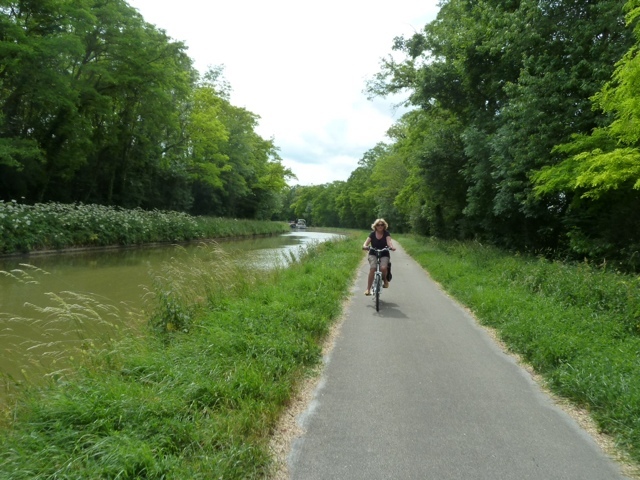 After lunch we cycled in to Santernay for more wine tasting along a lovely canalside path through picturesque countryside. Santernay is another beau village similar to Mersault. The first cave presented wines that even we did not like! But further up the hill the grand Chateau de Santenay did. 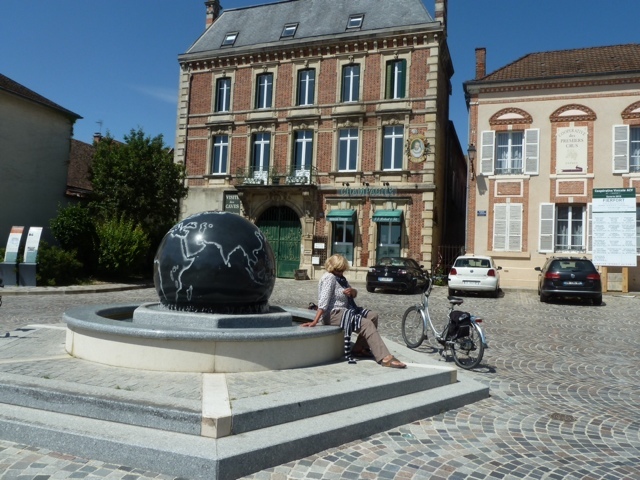 Tomorrow we head for Champagne - another long drive but we're not too concerned as a rainy day is predicted - better to travel then! Day 26. Chagny - Epernay 212 miles. Up and at them for 10.30am ready to go - reception shut at 10am. Arggh! They have our ACSI card so can't leave without it! Decided to go to Challons-sur-Saone about 10 kms away to do last big shop and fill up with petrol (85p a litre ha ha!). 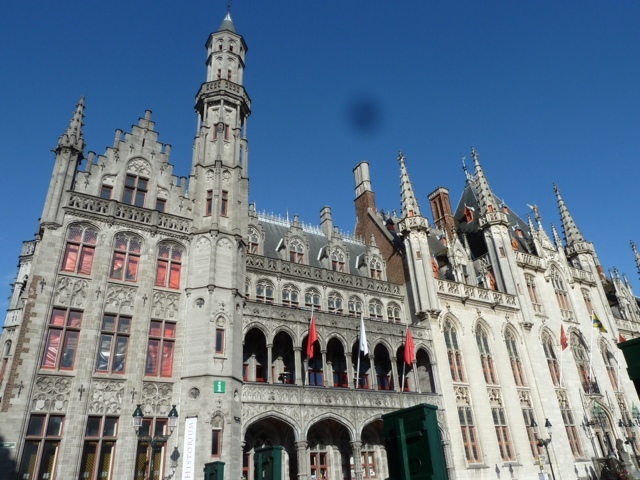 Passed the time visiting an enormous Carrefour and then on to - gasp- McDonalds for lunch! Carol much impressed that Heineken lager is included in a meal deal. At least one of us was happy. Back to the site and Graham managed to persuade the reception to open and let him pay at 2.30 pm. So, 85p/litre at 30mpg for 200 miles + €37 tolls @ 1.39£/€ vs £1.35/litre no tolls. Who's the winner? No tolls hands down. Diesel would have to be almost free to draw even with tolled roads. A warm welcome at the municipal site in Epernay. When we asked the nice man at reception if Champagne Ayala was far he replied no, and would we like him to ring for us to arrange a tasting? Seeing as his french was a lot better than Graham's we said YES PLEASE! A certain birthday boy needs a Magnum of something special next month. Good news! We are booked in to Ayala at 4pm for a degustation. 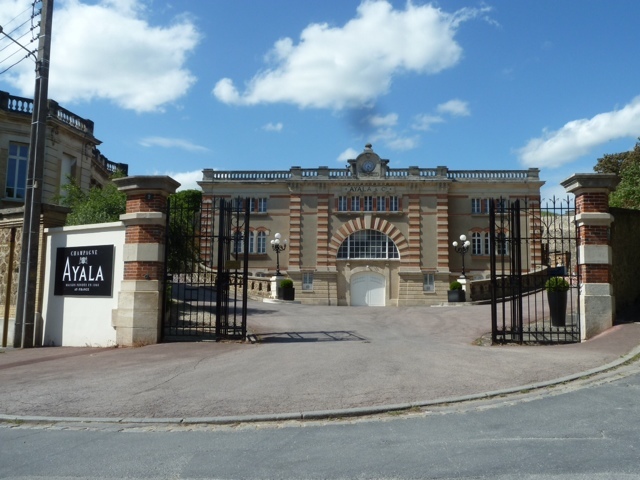 We walk round Epernay peering through locked gilded gates and wonder where everyone is. Last time we came to Reims and Epernay we remember buses with hourdes of tourists queueing up at all the major houses for tours but now there is nothing. All the major houses either charge for tasting and don't offer tours, or do not open to the public at all. Only Mercier continues to publicly open it's doors for visits. 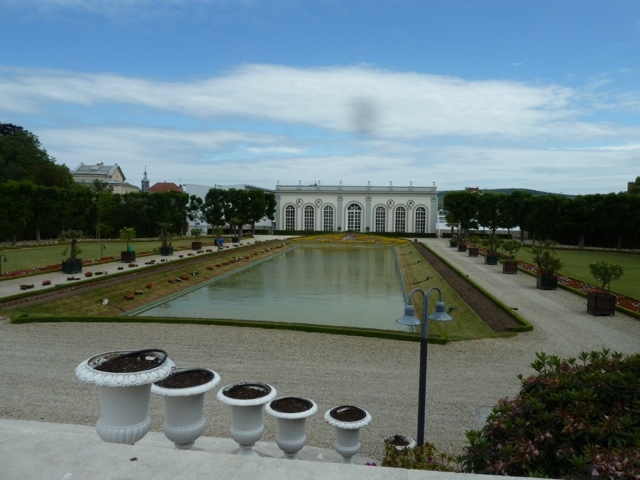 The garden at Möet undergoing refurb. Möet is shut for refurbishment, Pol Roger is a no no, likewise Perrier Jouet, most gates are locked. We look up Ayala. Ayala is on the up, at 300,00 bottles it is now a boutique arm of Bollinger and does tasting by appointment only and definitely no tours. Ooer, we are turning up all sweaty on bikes again and worry if we've bitten off more than we can chew. We arrive early, and kick around Ay for a few minutes until just decently early. One of us manages to stay awake. We mull over why we were visiting Ayala. Graham being under the delusion that we bought Ayala for his 40th birthday when we had a weekend trip to Champagne. The building that we approached today bore no resemblance to the shed in the vineyards that we remember - perhaps we'd visited a lesser marque - a producer for the local co operative perhaps?! It's a steal, given the current exchange rate, so we buy more than we planned, and as much as we can carry. 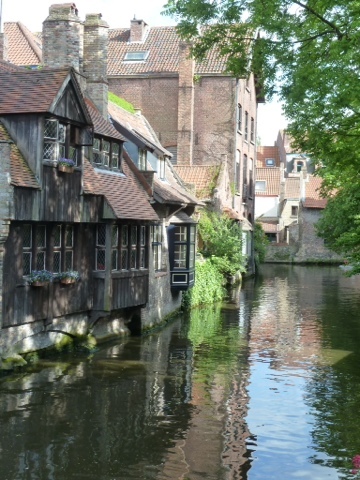 Dull day today so liesurely drive to Brugge so we have a short hop to the ferry the day after. We arrive at the campsite about 3:30 and walked into the centre. A rather long 40 mins walk. Had dinner outside facing the main square - a very touristy place but very pleasant and reasonably priced. The sound of the bells from the Belfry tolling every 15 minutes was a little distracting - not just a mere ding dong but full on tunes like - "it's a long way toTipperary" ! 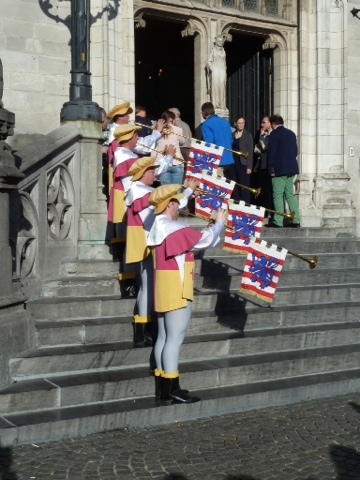 During dinner there was a series of trumpet calls - apparently some local beauracrats were attending a civil meeting - the trumpeters looked snazzy though! Carol managed to dash to the steps from her restuarant seat like the paparazzi to get a good shot. A lovely evening and our last night of our tour... 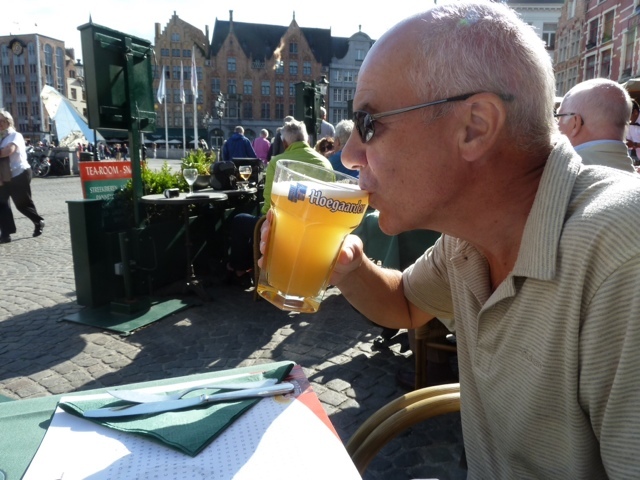 Tomorrow evening we get the ferry back from Zeebrugge. We have a day to kill so had a lazy start and breakfast al fresco follwed by a visit to the local Carrefour for last minute wine and beer purchases. We decide to find a coastal place to take lunch in and chill before the evening ferry crossing. 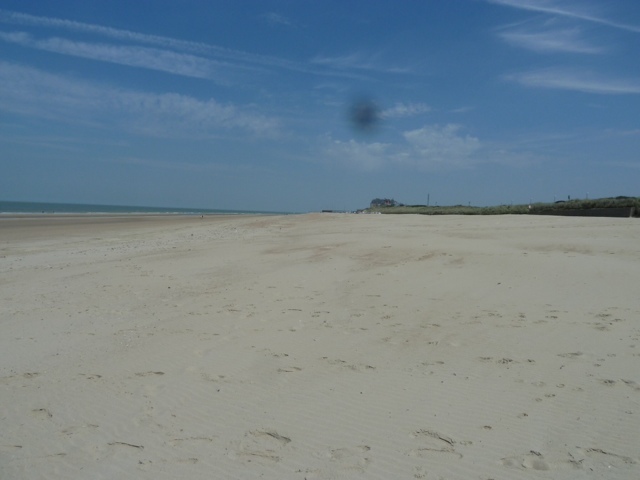 Carol has been struck down by la grippe - man flu or a severe cold virus, so after a sleepless night opted to stay in Rex for lunch and a lie down whilst Graham explored the beach at Wennduine with a picnic, almost on his own. A little nearer to Zeebrugge we had a wander round Brandeburge, a large seaside resort with a 1,000 boat marina (oh how Graham likes a marina!) The place appeared to be a sophisicated Cleethorpes but had nothing Cleethorpes had: tattoo shops, amusement arcades, and a couple of things Cleethorpes doesn't have: sun, beach bars. 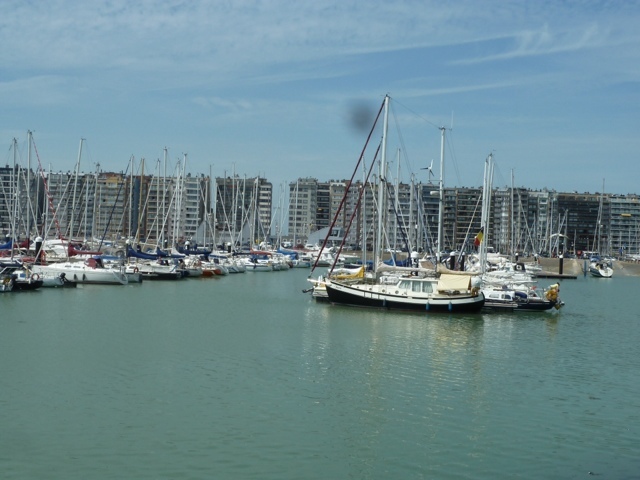 Oh yes, and did we mention the marina? We were a little early for the ferry and after a minor hiccup when we tried to drive on to a ferry to Finland not Hull much to the crew's amusement! - we boarded and so began our homeward journey..... A la prochaine! 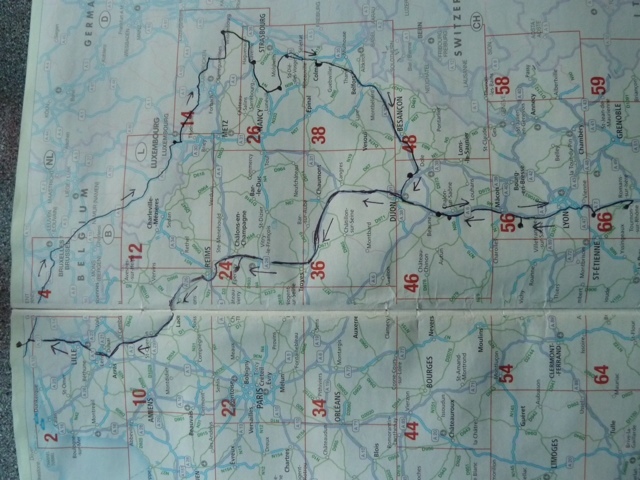 A photo of map of our route - just readable if you squint enough! !